Now that the Oscars are complete (with virtually NO real surprises), I can get back to posting a couple reviews on films I've seen in the past couple weeks. Ryan Coogler's monumental Marvel achievement of Black Panther is continuing to churn up both critical and box office acclaim. Set in the corner of the Marvel universe in the fictional world of Wakanda, Black Panther weaves the story of a young man named T'Challa (Chadwick Boseman) who is thrusted into the role of king of his country after the events set forth in Captain America Civil War that left his father dead. T'Challa, his sister Shuri (Black Mirror's Letitia Wright) and his loyal servants (including Lupita Nyong'o and Walking Dead's Danai Gurira) look to stop the nefarious actions of South African black market arms dealer Ulysses Klaue *claw* (a buff non-motion-cap Andy Serkis) who is linked to a troubled vigilante named Erik Killmonger (Michael B. Jordan). The film opens in Oakland, California (Coogler's hometown) in 1992 with flashback sequences that shape the narrative of the film. Kudos to including Sterling K. Brown who plays T'Challa's uncle N'Jobu in these scenes. This setup helps ground this movie in reality somewhat and helps link some of the messages in the film with the present day. I don't want to spoil the key plot points of the movie as there are a few twists and turns that are better experienced first hand. Thankfully the story of Black Panther is a well crafted one and particularly the second half of the film works well almost chiefly because of the villain portrayed on screen by Michael B. Jordan. 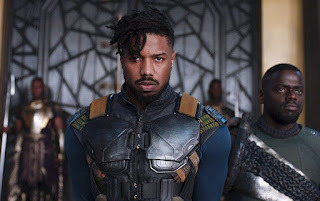 Erik Killmonger is such a layered character and his motivations are so understandable that you almost feel yourself rooting for him at times. Jordan plays him with such a passionate bravado giving yet another killer acting turn in an already accomplished career for the young star. I feel Black Panther has a real chance to be a 2018 Best Picture nominee and Jordan has an outside shot of earning a supporting actor nomination following in the footsteps of Heath Ledger as one of the more memorable comic book movie villains of all-time. Jordan and Coogler might have the best working relationship in Hollywood right now (however we'll soon be seeing Jordan without his main man in the upcoming Creed 2). This is easily the best ACTED Marvel film ever made. All of the actors give their best effort, especially Wright and Jordan. Wright gives an effortless fresh performance that makes you think that she's just having an absolute blast making this movie. 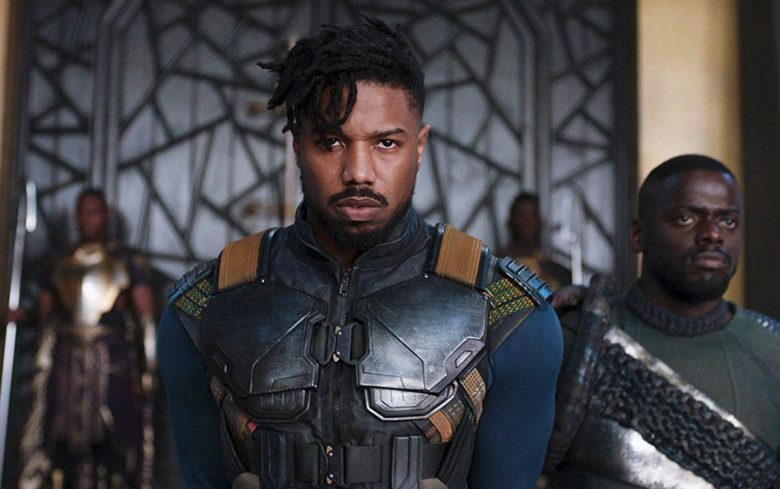 Boseman is solid as usual in the title role and newcomer Winston Duke is a scene stealer as M'Baku, a powerful (and sometimes humorous) leader of the Jabari tribe. The only sub-par performance I saw in the whole film was Get Out's Daniel Kaluuya who almost seems to be mailing in his scenes. I guess he was just so good in Get Out that I expect a little bit more from him. Black Panther represents a groundbreaking cinematic moment that also happens to be a damn good movie. Despite a few story and character issues (Martin Freeman's character was both annoying and not 100% necessary in this film), Coogler and his whole crew came with their "A" game and delivered what surely will be one of the more entertaining films of 2018. The supporting musical score from Ludwig Goransson adds just the right amount of African percussion to the themes of the film and serves as a unique and complimentary addition to the action on-screen. I can't wait to see what Ryan and Michael B. Jordan in particular do next and I'm EXTREMELY interested in the path that the brilliant Letitia Wright takes in her career. A very solid 4.5 out of 5 JRs for Black Panther. Wakanda Forever! Alex Garland has been a screenwriter in Hollywood for a long time (he wrote 28 Days Later for Danny Boyle) but only recently has moved behind the camera in a directorial role. His big-screen directing debut came in 2014's thought-provoking cyber-thriller Ex Machina. 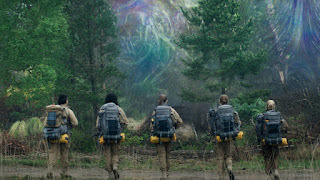 His follow-up is Annihilation, a loose adaptation of the well-received Jeff VanderMeer science fiction novel of the same name. Garland definitely takes a lot of liberties in putting on-screen his vision of the novel (I have not read the book but I hear it is very different from the film) and takes multiple risks that leave the audience trying to fill in the plot gaps and make sense of an "out-there" ending. The movie centers on Lena (Natalie Portman), a professor of cellular biology and former Army soldier who loses her military soldier husband Kane (Oscar Issac - once again teamed with Garland) for 12 months under mysterious circumstances. Lena ends up being deployed outside a quarantined swath of land in the Northeastern US (Area X) that has experienced and unexplained biological phenomenon (called The Shimmer) that ends up consuming everything that enters it. Teams have tried to explore the area before but have not come back alive. Lena joins a team of female scientists including characters portrayed by Jennifer Jason Leigh, Gina Rodriquez and Tessa Thompson (fresh off her Thor Ragnarok turn) who enter Area X, passing through the Shimmer in an effort to understand the phenomenon and make sense out of the growing foreign substance. What happens in Area X is both astonishing and unsettling at the same time. The film earns its R rating with some gore and downright horrific events that unfold. There is a specific scene in which a bear-like undead creature haunts the team of scientists in a terrifying encounter. The creature has screams that mimic a previous victim and the production value and Garland's execution of the direction in that sequence is top notch, delivering a truly scary scene that could highlight a true horror film. One by one, Lena's team faces adversity and unknown biological and physiological reactions that are mostly unexplained. The final 20 minutes of the movie culminate in an extra-terrestrial encounter that kinda runs off the rails a bit. I didn't fully understand what I was watching, but at the same time I liked the audacity of the choices made by Garland. Throughout this movie he stays true to his vision and doesn't really care what the audience thinks about it. It reminded me of moments in 2001 A Space Odyssey in which Stanley Kubrick brings the weird and wonderful without reservations. Overall I liked this movie. It didn't make total sense in the end but it was one of those films I kept thinking about long after I left the theater. It's always good to see original science fiction delivered to us on the big screen and I hope Garland will continue to innovate and create unique stories in the sci-fi realm. This is worth a watch for Portman and Rodriguez's performances and for the visual tone that's beautifully conveyed on-screen. A solid 4 out of 5 JRs for Annihilation, a film that probably isn't for everyone but isn't afraid to be bold and inventive. For what it's worth, to its detriment, the movie answers quite a bit more than the (first) book does. By the end of the trilogy, all's been laid out, but Annihilation is a pretty perfect, standalone work that answers nothing and lays out some very interesting questions that are actually absent from the film. If I had my way, I'd have cut the 2nd scene from the film entirely (we see a comet land). That alone would have done wonders.